MASVINGO - Government must seriously take heed of the statement underscored by millions of Zimbabwean workers in both the formal and informal sector who staged a successful three day stayaway that saw a total economic shutdown between Monday and Wednesday. 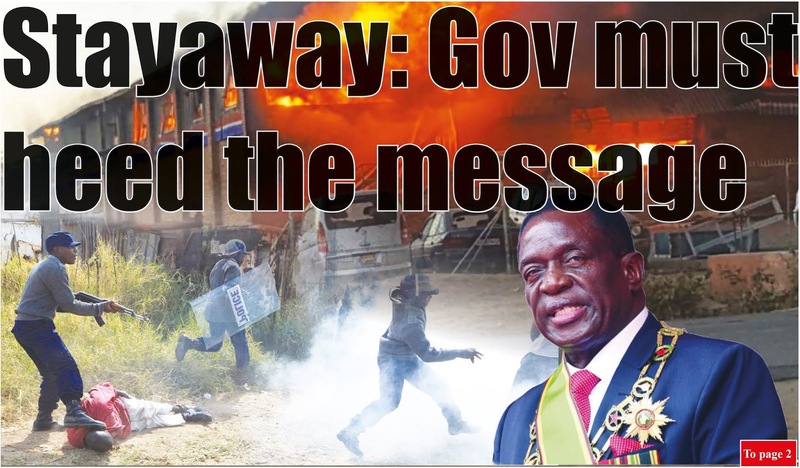 Analysts who spoke to The Mirror in interviews said although the stayaway may not bring immediate results to the suffering masses, the success of the action is a clear message to Government that people have suffered enough and may not be able to contain anything beyond this. President Mnangagwa describes his Government as a listening government. The analyst said that the unison of the people’s action was triggered by genuine concern of economic hardships worsened by the recent 135% increase in fuel prices. They said Government appears to be taking a laid-back approach to the problem and taking people for granted. 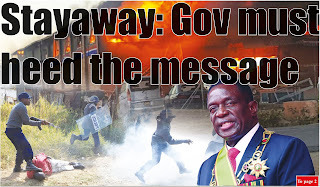 The stayaway which began on Monday has seen all major cities and towns in the country suspending economic activities with public transport operators doubling their fares and, in some cities, there have been serious cases of violence. Public transport to and from Harare to major towns was virtually not available as some operators feared for their lives while others withdrew their vehicles to support the stayaway. Analysts, members of the business community and ordinary residents who spoke to The Mirror are all agreed that dialogue between the two main political parties, Zanu-PF and MDC Alliance holds the fate of the country. Political analyst and Great Zimbabwe University lecturer, Dr Takavafira Zhou said that the post shutdown period is likely to produce a blame game between MDC and Zanu PF over the leadership of the stay away which turned violent especially in Bulawayo and Harare, while economically nothing changes. He also added that there was need for a plan after the stay away but on the ground there don’t seem to be anything and the status quo is likely to remain. In the unlikely scenario he said dialogue between Zanu-PF and MDC may begin. “It is a serious challenge because political parties are not open to dialogue which will improve the economy. In my view we are ages from dialogue and the more likely outcome is a blame game between the two main political parties, that is Zanu-PF and MDC Alliance. “Zanu-PF is likely to blame MDC for mobilising the shutdown and the violence that came with it while the Alliance will also take a swipe at Zanu-PF for an attempt to burn down Morgan Tsvangirai House the MDC headquarters. Zanu-PF should learn from the shutdown and address the economic challenges the country is facing or there are likely to have power ceased from them by violence,” said Zhou. Professor Eldred Masunungure is of the view that Zanu-PF should engage in dialogue with other political parties and stakeholders in regards to governance and shape a common national interest and implementation method. “Sitting down and discussing is the only way forward. Industrial action will lead to political tension between Zanu-PF and MDC Alliance in terms of government, that is whether Zanu-PF will have a go it alone policy or will have a unity Government or a broader coalition including other political parties, civil society, among other players. “There is need to have a well defined and structured national interest which is agreed to by all players unfortunately the parties are worlds apart,” said Professor Masunungure. GZU lecturer and political analyst Dr Fidelis Duri said that Zimbabweans have lost trust in President Emmerson Mnangagwa who has chosen to remain silent in the midst of price escalation of basic commodities. “Zimbabweans have lost faith in President Mnangagwa. It is unbecoming for a President to announce increases in prices of basic commodities. The people are fed up, in a month prices went up and nothing has been done to rectify the matter. “A month on and the price of fuel has doubled, the people are fed up and the opposition is taking advantage,” said Dr Duri. Masvingo based businessman, Edson Zvobgo Junior is of the view that the industrial action will not have any positive impact on the economy as production has been suspended. “I understand the grievances of the organisers but I believe it has a negative impact on the economy, the people should have found other means of expressing themselves without suspending production as this will negatively affect our revenue,” said Zvobgo. Zanu-PF provincial youth chairman Brian Munyoro said stay away is not good as it does not promote peace. “People should not be intimidated using social media, they should just continue with business as usual. Masvingo people are very peaceful as they did not engage in any violent activities, we should not destroy our infrastructure,” he said. Zimbabwe Union of Journalists (ZUJ) vice president Godfrey Mtimba emphasised on salary increase to all employees now that prices have gone up. “Employees should increase salaries because prices have skyrocketed. As for the stay away, people are constitutionally entitled to engage in demonstrations and stay away and they should be peaceful,” said Mtimba. Fadzai Musoni a vendor in the CBD said that the fuel price hike was ill timed as prices of basic commodities are likely to follow suit. An economics lecturer at GZU who declined to be named said the issue is not about fuel only as all the economic fundamentals must be addressed as well. “The whole basket of issues need to be corrected, the currency issue and production are two issues that should be addressed first everything falls into place,” he said.